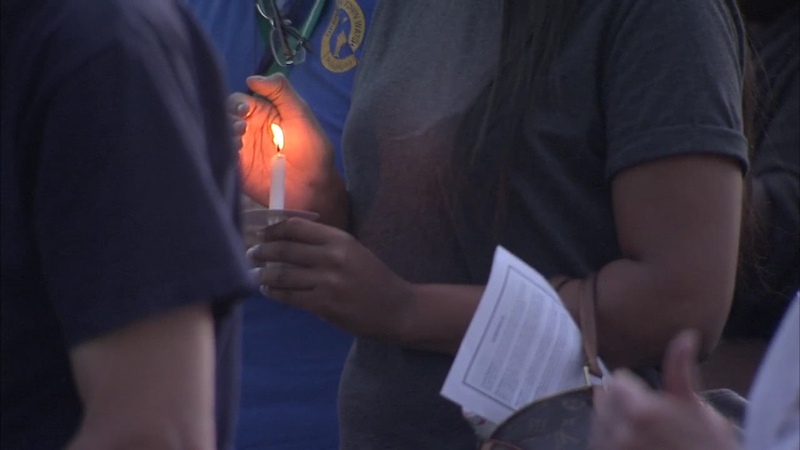 Families of the victims of the Amtrak 188 derailment were joined Thursday night by first responders in remembrance of the eight killed and 200 others injured. PORT RICHMOND (WPVI) -- Families of the victims of the Amtrak 188 derailment were joined Thursday night by first responders in remembrance of the eight killed and 200 others injured. The memorial ceremony was held near the site of the crash in Port Richmond. "It is through sharing our grief and supporting each other that we are able to start on the road to recovery," Lisa Hogan of the PFD Family Association said. As Amtrak trains rolled by behind them a few feet away, they laid wreaths for the 8 people who were killed. Among those in attendance were the parents of victim Laura Finamore of New York. "Oh this is wonderful what they're doing and the mayor had a service earlier today that was wonderful," father Richad Finamore said. Neighbors in Port Richmond who sprang into action to help the victims of Amtrak train 188 still vividly remember that horrible night one year ago. The neighbors who sprang into action still remember that horrible night. Tiffany O'Neil is one of the neighbors who that assisted the injured, first responders, and throngs of media after the train derailed. "I let people use my phone, my neighbors gave out water, my friend gave her shoes to somebody," O'Neill said. "A lot of people pulled together." Ed Hallowell lives and works near the crash scene. "There were people trying to jump the fence, get water to people, help people as much as possible," said Hallowell. His employer, Cabrun Ink Products, opened its doors during the surreal week. "It was mostly use of our facilities for any of the Amtrak people or police officers," said Sharon Reich-Cerogino. "It was just really sad, it was just sad knowing that it happened out there... we could see one of the engines from the back of our building." Clown House Restaurant kept its grills on after hours. "I helped how I could. The neighborhood really came together," said Ron Bordone. Video from Chopper 6 shows the aftermath of the crash of Amtrak 188. Few in the neighborhood knew someone hurt or killed in the crash, but they are forever linked to the tragedy. "When I'm walking by to take him to school, yeah it does," said O'Neill. "I think about it when I look over there," said O'Neill.